Today being the first official day of the summer, it only seemed suiting to celebrate with the perfect meal for a warm sunny day. When tomatoes make their way to the farmer's market and are perfectly ripe and sweet it breaks my heart to overpower them with too many other ingredients or to cook them down. This tart is just perfect for that kind of feeling because the tomatoes stay uncooked, just lightly dressed with olive oil and red wine vinegar, and lay atop a parmesan crusty dough with a goat cheese cream. Served with a simple lemony salad and a cold drink, it really is a blissful meal. I really like flavoring doughs and this particular dough was just delicious with added parmesan. The only important thing is to really make sure that the butter is cold when you want to use it to make the dough. This will make sure that the dough has the right consistency and will form nicely. The dough is more of a crispy kind of dough but lends itself quite perfectly to the plump tomatoes and velvety goat cheese. Every summer, a couple dishes really stand out in my kitchen, and this is definitely one of those dishes .... for the time being, summer has just begun! Place the flour, parmesan, butter and salt in the bowl of a food processor and process for 1-2 minutes or until the dough resembles fine bread crumbs. Add the egg and milk and process for 2 minutes or until a smooth dough forms. Wrap in plastic and refrigerate for 30 minutes. Preheat your oven to 350F. Cut the dough in half (if making 2 tarts) and roll out between two sheets of parchment paper. Roll the dough to make two evenly sized circles, about 1/4 inch thick. The dough is quite fragile, so roll with care! Prick pastry base with a fork and place on a parchment-lined baking sheet. Cover with a circle of parchment and fill with baking weights or rice. Cook for 15 minutes. Discard the paper and weights and cook for another 10 minutes or until the dough is just cooked though and lightly golden. Place the tomato slices, vinegar, olive oil and a good pinch of salt and pepper in a bowl. In a separate smaller bowl, add the goat cheese and pesto (if using). Extract 2 teaspoons of the tomato vinaigrette and add to the goat cheese to make it creamier and less dense. 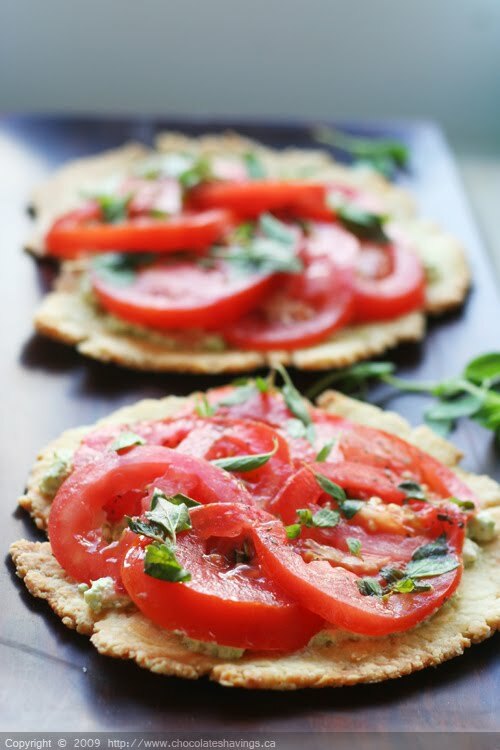 Using the back of a spoon carefully divide the goat cheese cream between the two tarts and top with tomato slices. Garnish with torn oregano leaves. Enjoy! that looks so incredibly good and you are right that it is the perfect way to eat tomatoes! i love simple tarts like this in the summer - a glass of chilled wine and the evenings are perfect! A typical Italian dish, perfect in his colours and flavours! That tart looks perfect. I am always up for something with goat cheese. Looks gorgeous and delightfully fresh. How perfect for summer! Now if my tomatoes would hurry up and ripen! I was sold at goat cheese. This looks so delicious! I have only one word to describe this..........glorious! I love tomatoes and I love the thin crust you have mad ehere....and goat's cheese cream...nope it does not get any better!! I think the tomato goat cheese combination is divine! this just looks mouthwatering, so fresh and simple...I'm loving this tomato season! This looks simple and PERFECT. Yum, tomatoes & goats cheese perfect combination. Wow, I love the version of a tomato tart. I love that the pastry is flat, like a cookie. That just makes it so easy and also makes for an interesting presentation. Can't wait to try this. This looks perfect for a picnic!